home of the weekly seafood giveaway! 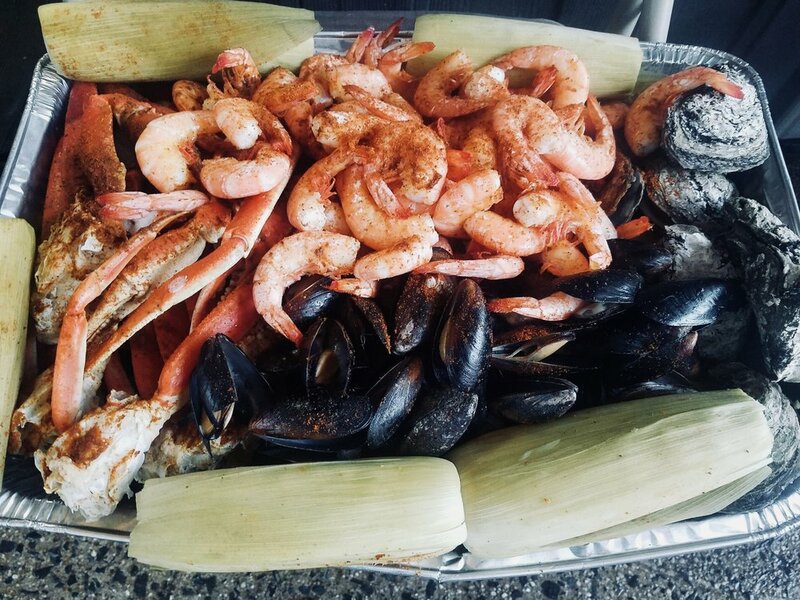 Located in Elkridge, Maryland, DR Seafood is the "go-to" spot for fresh seafood, tasty BBQ, and plenty more! 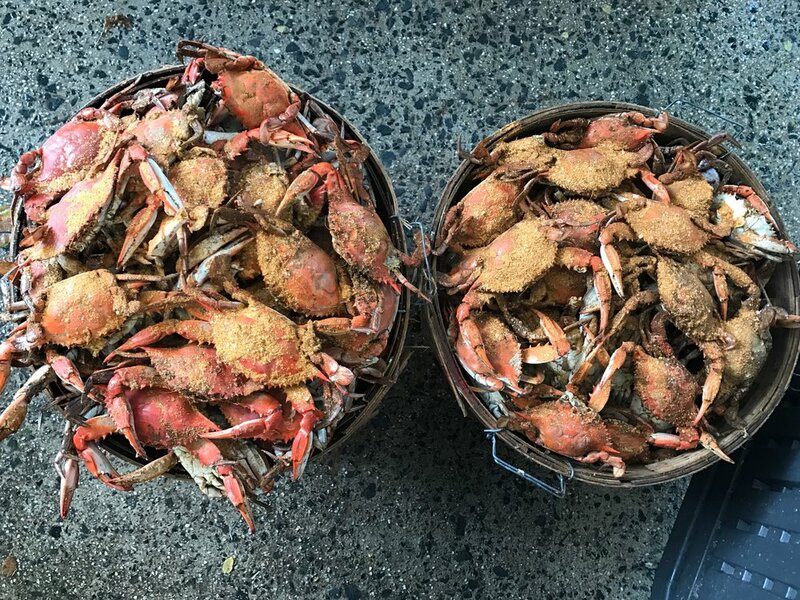 David Reich, an Elkridge local for 50 years, has been crabbing, fishing, and cooking up amazing dishes his entire life. He had a vision to open a place where crabs, seafood, and many of his delicious homemade dishes were shared and loved by other people. DR Seafood and Catering was then founded in 2013. Since then, David has made it his mission to deliver the best crabs and take-out food in the very same town he grew up in. At DR Seafood, our goal is to provide both delicious seafood and a superior customer experience for our customers. We are also home of the weekly free seafood drawing. Be sure to like us on Facebook to qualify for free seafood every week! 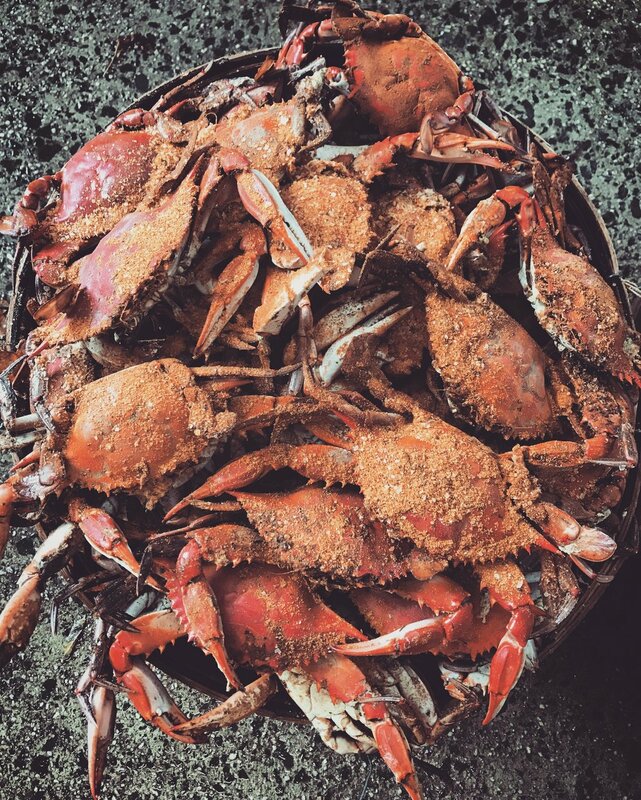 We offer fresh crabs, seafood, BBQ, salads, and produce year round. We also have a full menu filled with delicious over stuffed sandwiches, hot and made to order platters, filling appetizers, and much more! We love our customers and welcome your feedback and suggestions. Use our Contact Us page to tell us what we’re doing right, what we can improve on, or to just ask us a question. DR Seafood & Catering is here to serve you! Thank you for supporting our local watermen! *our steamers shut down at 5:30pm daily. *Please note during winter season we close any time between 4pm-6pm. Please call ahead for orders during this time. *Hours are subject to change due to weather, road blocks, and other circumstances. Homemade- heart and spicy. With a generous amount shrimp, chicken, crabmeat, and andouille sausage. Homemade- Tomato based mix. With hearty vegetables, fresh lump crab meat, crab claws. Homemade- Creamy based. With jumbo lump crab meat. Homemade- Cream based chowder. With onions, celery, and potatoes. Homemade. Filled with spicy ground beef, andouille sausage, peppers, beans, and a special spice. Homemade-Milk based soup. With delicate seasonings to augment the tender succulent oysters. All Sandwiches are served with a bag of chips and pickle. Your choice of cod, whiting, haddock, flounder. Fried soft crab with a touch of old bay. Soft tortillas, coleslaw, pico de gallo, and cheese. Homemade. (6oz) Filled with jumbo lump crab meat, special seasoning, and the perfect amount of flavor. Open faced sandwich with french fries and smothered in beef gravy. Open faced sandwich with french fries and smothered in turkey gravy. All Platters are served with 4 hush puppies and a choice of 2 sides. Lettuce, Tomato, Mayonnaise, Mustard, Ketchup, Hot Sauce, Onions, Pickles, Relish, Hot Peppers, Tartar Sauce, Cocktail Sauce. Chili ($1.00), Gravy ($1.00), Bacon ($.50), Peppers and Onions Mix ($.50), Sauerkraut ($1.00). Mix of medium, large, x-large crabs. Great for small groups. Mix of medium, large, x-large crabs. Great for parties. 6 steamed crabs, 6 steamed oysters, 6 steamed clams, 1/2 lb of x-large shrimp, and a bowl of Maryland crab soup. 1 lb dungeness crab, 1 lb snow crab legs, 1/2 lb x-large gulf shrimp, and a bowl of Maryland crab soup. 6 steamed crabs, 1 lb x-large shrimp, and a bowl of soup of choice. 1 lb Maine lobster, 1 lb Maine mussels, 1/2 lb x-large shrimp, and a bowl of New England clam chowder. All steam pots come include potatoes, andouille sausage, and steamed corn. Seafood can be purchased live/raw or we will steam for you on the spot! Please call at least 45min ahead for steam pot orders. All Crabs are measured from point to point and all seafood is weighed before steaming. DR Seafood & Catering offers a catering experience for any occasion like no other! We know that some moments just don't call for the average hot dogs and hamburgers on the grill. With a wide variety of menu items, our catering services are the perfect solution to spice up any event or party. We will make sure we do everything we can to suit all your guests needs. There's something for everyone to love and plenty to go around. Our catering is available for pick up or delivery, all year! We cater weddings, family gatherings, birthdays, TV sporting events, bridal showers, family reunions, graduation parties, holiday parties, internal meetings, corporate events; you name it and we’ll cater it. Some of the most popular items we cater are bushels of crabs, pit sandwiches platters, crab cake sandwiches, tuna salad & shrimp salad trays, and more! Two week notice is recommended for all events but can accommodate orders with shorter notice. Be sure to include how many people will be attending, menu items you would like, the time of the event, etc. DR Seafood & Catering Guarantees All Crabs! We always want our customers to be happy with our services. If you are not satisfied with the taste, texture, or fullness of your crabs, please feel free to return the crabs to us for an exchange. We will issue an in-house credit crab for crab exchange for the size that was purchased and returned to DR Seafood and Catering LLC. We cannot issue credits for crabs that are not returned. You may return the crabs to DR Seafood & Catering LLC within seven (7) days from your purchase date, and will need a receipt to accompany your exchange. We do not offer monetary refunds. We change up our specials each day, but we always have a some sort of special running. We also run specials on crabs, shrimp, soups, and other menu items that are not listed above. Every week is different, so give us a call or stop by to check out today's special! !